You’ve been asking for it and we’re Whisking It up for you in 2019!! prepping, cooking and let’s face it, NO ONE likes to do dishes. We are here to help! Fit Feasting Meals are prepared in our certified and inspected Commercial Kitchen and are designed with 4-6 ounces of lean protein and to be under 15 Net Carbs of energy boosting carbs and vegetables. Each meal will be fully prepared, ready to heat and eat and packaged with instructions and ingredients listed. Orders need to be submitted via email (orders@wickedwhiskricelake.com) or phone call (715-434-2253) by 3:00 p.m Thursday afternoons for pick up Monday or Tuesday the following week. 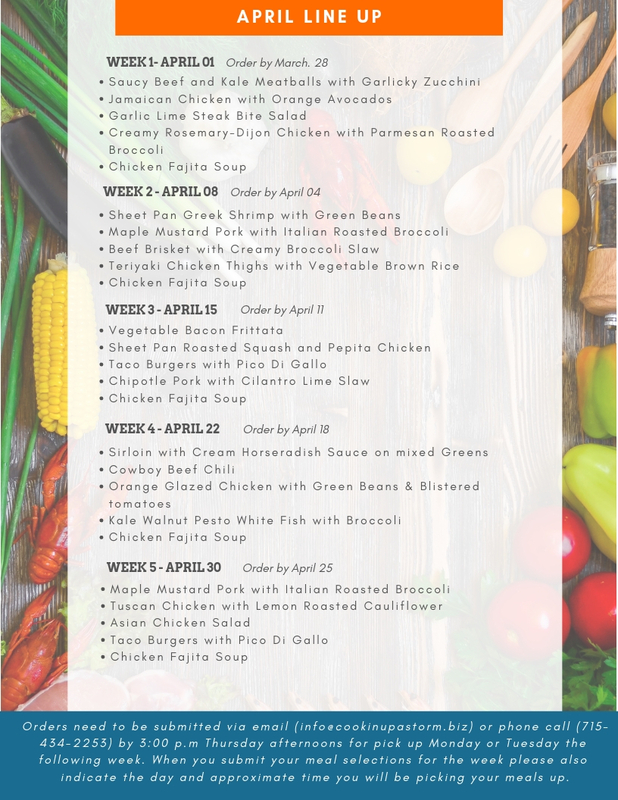 When you submit your meal selections for the week please also indicate the day and approximate time you will be picking your meals up. Meals can be picked up on Monday’s or Tuesday’s any time during business hours (7:30 a.m. – 3:30 p.m.) at The Wicked Whisk, 422 North Main Street. Payment can be made with cash, check or credit card. Orders need to be submitted via email (orders@wickedwhiskricelake.com) or phone call (715-434-2253) by 3:00 p.m Thursday afternoons.